In the present days the solar modules are manufactured with two wire leads that have two Mc4 connectors on either side, and these connectors used for transfer the D.C power to next level electrical equipment. So that we can easily connect two or more modules in series by mc4 connectors to get effective voltage. The modern high power modules are having junction boxes at their back side that has a two wires namely negative terminal and positive terminal with mc4 connectors. According to the design of modern high power modules, always negative terminal is associated with female connector and positive terminal is associated with male connector. If you want to connect two modules in series it is very simple by mc4 connectors. You can see in below figure that module has two wires with mc4 connectors that one is having positive terminal and negative terminal respectively. In series connection the module mc4 connectors together by connecting positive lead on one module to negative module in another module. Simply the male connector in module is inserted into female connector in another module. Mc4 multi branch connector: If you are looking for parallel connection of two modules, then it is better to use multi branch connector at module level. 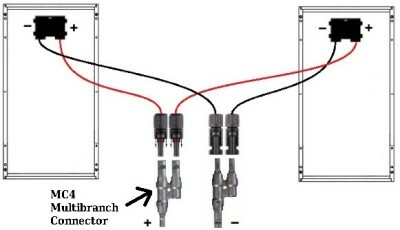 The parallel wiring requires the positive leads to be connecting together and negative leads to be connect together of their respective modules. Suppose modules are rated at8.83 Amp current and voltage about 37.4v, If you connected two modules in parallel then current would be 17.66Amp and voltage will remains same as module voltage i.e 37.4v. Mc4 extension cable: Extension cables are used to combine the modules and combiner boxes. It has two Mc4 connectors on its either sides, namely male connector and female connector. The two solar modules that you’ve already connected together have one positive lead with a male MC4 connector and one female lead with a female MC4 connector. The male Mc4 connector and female Mc4 connector of extension cable has to be connected with male and female connectors of modules (which are in series combination).